This section contains information about how the OIO outlines its approach to assessing the land types and land area thresholds used to determine whether land is sensitive land. This page contains advice on how to determine land types, including non-urban land and farm land. However, note that a final determination may be highly dependent on the facts of each case. A land area threshold is used to determine whether land is sensitive (under Table 1 of Schedule 1 of the Overseas Investment Act 2005) or whether the adjoining land is sensitive (under Table 2 of Schedule 1 of the Act). In the majority of cases, the land area will be the area described in the computer register (title) of the land being acquired. Exceptions to this general rule may exist in cases involving leases, subdivisions, multi-story buildings and unit-titled land/common areas. As Schedule 1 includes “associated land”, the definition of “associated land” in section 8 of the Act will need to be considered in calculating the relevant land area. The associated land provisions refer to "land A adjoins Land B". "Adjoins" means "touching, sharing a common boundary, touching at a point or along a boundary". Note: In some cases, no area threshold is prescribed (for example, land that is on islands other than the islands listed in Part 2 of Table 1, or the North and South Islands; or land that contains the foreshore or seabed; or certain land in the section 37 list). The second table in Part 1 of Schedule 1 includes a reference to the regulator’s (the OIO) list of additional properties for which the adjoining land is sensitive. Read the list published under section 37 of the Act (attachment below). Consent is not required to acquire interests in land that are exempted interests. “Exempted interests” are defined in section 6(1) of the Act as meaning an easement or profit a prendre. Forestry rights are deemed to be a profit a prendre: see section 3(1) of the Forestry Rights Registration Act 1983. Consent is also not required to acquire certain other interests in land, such as the acquisition of any interest in land for a term of three years or less. In calculating the term of an interest in leasehold land, all renewal rights or options are included. See section 12(a)(ii) of the Act. “Land” is not defined in the Act. The Shorter Oxford Dictionary defines land as “... (in law) usually together with any other buildings, etc. above the ground and any minerals, mines, etc., beneath it”. “Land” includes the physical aspects of the land, as well as the intangible rights capable of existing in land. These include rights to airspace (to such height as is necessary for the ordinary use and enjoyment of the land and the structures upon it). This principle has been extended to modern forms of landholding, such as the stratum estate (unit titles), and the subsoil (but subject to statutory restrictions). The Act refers to “an interest in land” – see section 12(a) of the Act. “Interest” is defined in section 6(1) of the Act as including a legal or equitable interest. A licence (ie. a mere permission to be on the land) is not an interest in land. However, if a “licence” gives a person exclusive possession of the land (by allowing the occupier to use and enjoy the property to the exclusion of strangers), the “licence” will be deemed to be a lease, notwithstanding the label by which the parties chose to place upon their transaction: Fatac Limited (in Liquidation) v IRD, CA227/01, 23 September 2002. A mining permit is not an interest in land: see section 92(1) of the Crown Minerals Act 1991.
any land other than land is both in an urban area, and used for commercial, industrial, or residential purposes. “Farm land” is defined in section 6(1) as meaning land used exclusively or principally for agricultural, horticultural, or pastoral purposes, or for the keeping of bees, poultry, or livestock. “Urban area”, “commercial purposes”, “industrial purposes”, or “residential purposes” are not defined in the Act. 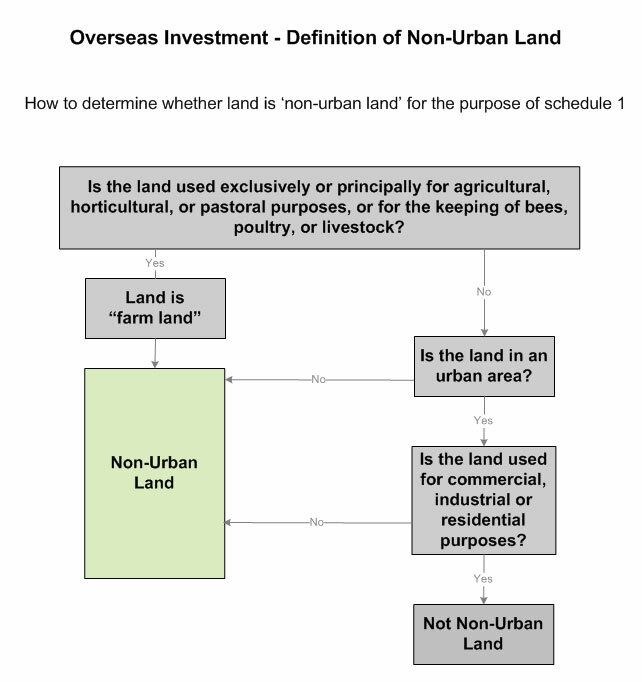 Use the following diagram to help determine if land is non-urban land. “Urban” is defined in the Shorter Oxford Dictionary as “of, pertaining to, or constituting a city or town; occurring in or characteristic of a city or town”. Black’s Law Dictionary defines "urban” as “Of or relating to a city or town; not rural”. zoning that is compatible with high density commercial, industrial and/or residential activity. District plans and aerial photographs are the most effective tools for assessing urban area status. The land must be used for commercial, industrial or residential purposes and must be zoned accordingly in the relevant operative district plan. Farm land is land that is used, exclusively or principally, for agricultural, horticultural or pastoral purposes, or for the keeping of bees, poultry or livestock. whether farming is a permitted use of the land in the relevant district plan. Land that is used purely for lifestyle purposes (i.e. the primary purpose is as a residence) is probably not farm land. Land that is used for forestry purposes is not farm land. “Agricultural purposes” includes the cultivation of soil for the production of food products and other useful products. “Horticultural purposes” includes growing plants in gardens, greenhouses, shadehouses, orchards, vineyards or hydroponically; and “pastoral purposes” includes the grazing of livestock. Farm land must be offered for acquisition on the open market before consent can be granted. The Regulations establish the procedure and minimum standards for advertising farm land. See standards for advertising farm land. the area of all the common property in the development. Under section 54(2) of the Unit Titles Act 2010, the owners of all the units are beneficially entitled to the common property as tenants in common in shares proportional to the ownership interest in their respective unit. However, the total area of common property must be included when calculating the area of land, not a percentage based on the unit owner’s entitlement, as the owner will have (indirectly, but beneficially) an undivided share in the common property. Each unit title includes an interest in the unit(s) and the share in the common property. Conceptually, the interests cannot be split. includes or adjoins land that is sensitive under Schedule 1 of the Act, and the relevant area thresholds are exceeded, then the requirement for consent provisions of the Act will be triggered if the proposed purchaser is an overseas person. Land parcels 1, 2 and 3 are each 0.3 hectares and the three principal units in an industrial unit titled development. Land parcel 4, the common property, is 0.15 hectares. Land parcels 1, 2 and 3 adjoin conservation land. The conservation land exceeds 0.4ha. O, an overseas person, proposes to acquire an interest in land parcels 2 and 4. Land parcel 2 adjoins conservation land. Land parcel 2 is sensitive and consent is required. Each unit in a 5 storey apartment complex is 100 square metres. The common property for the apartment complex is a recreation area (“Park”) of 0.2 hectares. The Park adjoins the foreshore. O, an overseas person, proposes to acquire an interest in a single unit (“Unit A”) and the Park in the apartment complex. Unit A does not physically adjoin the Park. The area threshold for land adjoining the foreshore is 0.2 hectares. Unit A and the Park are collectively 0.21 hectares. The Park is sensitive and consent is required. Associated land is defined in section 8(4) of the Act. Associated land is land owned or controlled by an applicant which adjoins, or is on the same island, and is, or will be owned or controlled by, the applicant or an associate. "Adjoins" means "touching, sharing a common boundary, touching at a point or along a boundary". You may need to aggregate associated land to determine whether land exceeds the area thresholds in Table 1 and Table 2 of Schedule 1 of the Act. However, the method for aggregating varies for each Table. Only aggregate the areas of associated land that that are of the same type. O, an overseas person, proposes to acquire land parcels 1 and 2. Land parcels 1 and 2 are associated land under section 8(4). For the purposes of Schedule 1 of the Act, land parcel 1's type is “land subject to a heritage order, or a requirement for a heritage order, under the Resource Management Act 1991 or by Heritage New Zealand Pouhere Taonga under the Heritage New Zealand Pouhere Taonga Act 2014”. For the purposes of the Schedule 1 of the Act, land parcel 2's type is “land that a district plan or proposed district plan under the Resource Management Act 1991 provides is to be used as a reserve, as a public park, for recreation purposes, or as open space”. The areas of land parcels 1 and 2 are not aggregated under Table 1 of Schedule 1 because they are not of the same type. Neither land parcel 1 nor land parcel 2 exceeds the threshold for their type. No consent is required. Aggregate the areas of all associated land. Land parcel 1 is 0.3 hectares and adjoins a historic place. Land parcel 2 is 0.3 hectares and adjoins land parcel 1. Land parcels 1 and 2 are associated land. The areas of land parcels 1 and 2 must be aggregated. Land parcels 1 and 2 are collectively 0.6 hectares. The area threshold for land adjoining a historic place is 0.4 hectares. Consent is required. In the case of a lease, the relevant area will be the leased area. If the leased area is less than the area of the fee simple title from which the lease derives, it will also be necessary to determine whether the leased portion of the land is sensitive (as opposed to the fee simple portion). Land parcel 1 is 1 hectare. Land parcel 1 adjoins land held for conservation purposes that exceeds 0.4 hectares. O proposes to lease all of land parcel 1. Land parcel 1 exceeds 0.4 hectares and adjoins land held for conservation purposes that exceeds 0.4 hectares. Land parcel 1 is sensitive. Land parcel 2 does not adjoin the conservation land. Land parcel 2 is not sensitive. If land is acquired under a proposed subdivision, the relevant area is the area of land that will ultimately be acquired by the overseas investor. If you have a query concerning multi-story buildings, please contact us. Sensitive land researchers may find the following resources helpful. Reserves Act 1977 and Conservation Act 1987 references. LINZ accredited Crown property service providers are able to conduct thorough research into the status of a property. They tend to have experience dealing with difficult issues relating to reserves and rivers. Surveyors may be required to determine the boundaries of a property relative to the foreshore, seabed, a lake bed or a riverbed. Look under "surveyors - land" in the Yellow Pages or contact the New Zealand Institute of Surveyors. District and regional plans and their associated planning maps are required to determine whether land is to be used as a reserve, public park, for recreation purposes, or as open space. They are also required to determine whether land is captured by items 1 and 2 of the list published under section 37 of the Act (attached below). District and regional plans and planning maps may also assist with identifying wāhi tapu sites, roads, waterways and esplanade reserves. The hard copy Heritage New Zealand register is the only reliable record of registered historic places, wāhi tapu (sites of special significance according to tikanga Māori) and wāhi tapu areas (groups of wāhi tapu). The electronic version is not a complete reproduction of the register and therefore cannot be relied on. Copies of the register can be accessed at every office of the Heritage New Zealand. For more information, read Sustainable Management of Historic Heritage – Guide no 8 – Overseas Investment Act 2005 (PDF 419KB). The New Zealand Archaeological Association holds extensive records of archeological sites. They also maintain a list of sites cross-referenced to mapping services. The New Zealand Gazette will record such matters as the grant of reserves status and the creation of roads. Aerial photographs may provide a useful overview of the property to assist with the assessment of whether the property is in an urban area. The Department of Conservation may need to be consulted where it is suspected that land is held for conservation purposes. Territorial Authorities may hold additional information to that found in district plans and planning maps.